Coming 20 July – DISTANT FIGURE (Passacaglia for Solo Piano) was performed and recorded by Anton Batagov. Batagov has had two recent albums on OMM including PROPHECIES and THE COMPLETE PIANO ETUDES LIVE FROM MOSCOW. 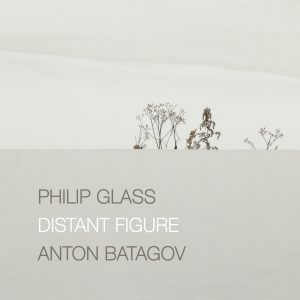 This new release, a digital single, is called DISTANT FIGURE and was written specifically for him by Glass. The piece premiered in Denmark in November of last year. Batagov went into the studio in the winter and recorded the work on an incredible Boesendorfer piano in New Jersey. The piece itself is what I like to think of as the second half of a diptych with MAD RUSH from 1979. For all the things said about Mad Rush, what has always been its interesting musical quality for Glass’ music of that time is that the piece is both Fast and Slow and represents a period of musical transition for the composer. Glass’ music up to that time had possessed a quality of musical elements turned on their heads: background being foreground, music which sounded fast with millions of swirling arpeggios was actually very slow process music which permitted the architecture of the piece to appear in a different time space than was conventional. MAD RUSH on the other hand was a rapprochement with tradition and the timespace in which the piece occurs has more to do with traditional perception of such things. DISTANT FIGURE comes almost four decades later yet possess a similar kind of musical alchemy. A passacaglia is nothing more than an old musical form and name of a street dance. It’s similar to a chaconne, a form which appears often in Glass’ music from the middle movement of Violin Concerto No.1, to the fifth movement of “Partita No.1 for Solo Cello (Songs & Poems).” In pop culture, perhaps it’s most famous use is the climax of The Godfather which was set to Bach’s PASSACAGLIA AND FUGUE IN C MINOR during the scene at the end of the movie where everyone is getting knocked off. A passacaglia is most easily understood as a piece in triple meter, like 3/4 for example, with a repeated ground bass over which variations are composed. The most divine example of this in Glass work is the second movement of his Eighth Symphony. Just like the Bach, you get a statement of the pattern which you can lock on to – usually 8 or 16 bars, and begin to hear and appreciate the variations of the melody (or arrangement) each time through the pattern. Just listen to the first run through of the harmonies in the second movement of Symphony No.8, memorize it – then listen again to the whole movement with fresh ears. As these things happen, the piece had an interesting genesis. Distant Figure started as a short piano piece Glass composed for the retirement of the head of Nonesuch Records Robert Hurwitz. That piece, only a few minutes, had a kind of premiere at Hurwitz’s retirement party at the Brooklyn Academy of Music. On that same program, frequent Nonesuch artist and Glass collaborator Kronos Quartet was performing and was preparing to ask Glass for a contribution to their “50 for the Future” project. Kronos Quartet liked the piece very much. Glass then adapted the piece, with some recomposition, for the medium of string quartet giving it the name Quartet Satz. You can hear that piece and download the score on Kronos’ 50 for the Future site here. Oddly, after spending so much time with the material, more than usual, Glass began to feel as if the work had more to say in a different form and set about creating a much larger piano work of double the length. The piece has a totally different emotional journey than MAD RUSH. Mad Rush is essentially a piece of two harmonies – F and A Minor. It goes from flowing music to hyper-fast with all sorts of Glassisms to give what might be a boring sequence of chords a true emotional trajectory. DISTANT FIGURE is a different things all together. It adheres to its prescribed sequence but with much more variety. Whereas MAD RUSH was originally written as a work for pipe organ and adapted for piano, DISTANT FIGURE is a pure piano piece. After a tranquil opening, we soon break into boiling passages of arpeggios and scales which are purely pianistic. In any case, the inherent emotionalism of the piece – that wonderful kind of Glass music where melancholy meets conviction – is the commonality between the two works. DISTANT FIGURE is an especially beautiful piece of music in any form. The difference lies in MAD RUSH being a piece without time, something of that internal engine of the universe which keeps on going even after the music stops, whereas DISTANT FIGURE is a terrestrial creation, a late-piece which very much represents acceptance at the end of a journey. DISTANT FIGURE will be releases on iTunes, Apple Music & Spotify on 20 July.